George Frideric Handel is one of the most prolific composers in the history of music. His body of work includes 42 operas, 25 oratorios, numerous cantatas and orchestral works and also pieces for piano, various chamber works, and sacred music. 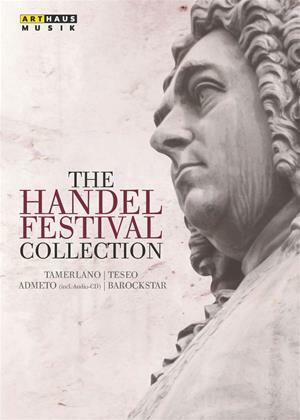 Arthaus Musik is now releasing a unique box set, The Handel Festival Collection, comprising the operas Admeto, Tamerlano and Teseo, and an additional documentary titled Barockstar. Admeto was one of the most successful operas in the first half of the 18th century. Axel Köhler, the celebrated countertenor and director based in Munich, Halle and Berlin, staged Admeto at the Opernhaus Halle in 2006, giving the opera an imaginative, contemporary twist. Following the 2004 performance of Handel's fifth opera Teseo, the festival audience responded with rapturous applause. Under the musical direction of Wolfgang Katschner, the Lautten Compagney produced a stunning spectacle of baroque music. Inspired by the success of the opera "Giulio Cesare", George Frideric Handel composed Tamerlano in just three weeks during July 1724. The coproduction on this DVD features the Handel Festival, the Goethe-Theater Bad Lauchstädt, the Theâtre des Champs-Elysées Paris, and the Sadler's Wells Theatre London with the English Concert conducted by Trevor Pinnock.